ETOS, or Electronical Tool for Object Sketching, is a tool for designers and architects that lets them see their creations in three dimensions without the need for 3D glasses. 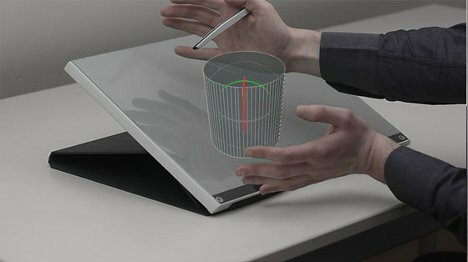 The tool uses the familiar shape of a pen and the intuitive function of a touch interface to bring sketches into the real world. 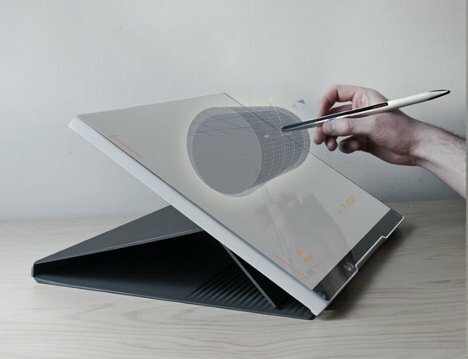 The drawing board takes the form of a tablet computer with a built-in stand formed from its folded cover. It displays objects in 3D using lenticular lens technology and motion tracking, which also allows users to move the shapes around with their hands. 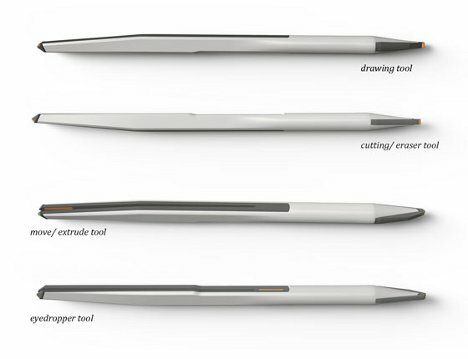 The pen-shaped input tool performs basic editing functions that are selected by simply turning it along the horizontal or vertical axis. Secondary functions can be selected by tapping the touch screen with 1-4 fingers.